A coalition of Niger Delta militant groups under the aegis " Coalition of Niger Delta Agitators, have asked all Northerners in the region to leave on or before October 1st this year. Rising form an extra-ordinary meeting in Port Harcourt, Rivers state yesterday, said failure to do so, they would attack all the oil wells in the region that are owned by northerners. The group berated the Federal government for holding peace talks with the Northern leaders despite the hate speeches emanating from the youths of the region in recent times. They demanded that all oil wells owned by Northerners be returned to people from the Niger Delta region. The militants also demanded the immediate relocation of NNPC headquarters to Niger Delta region as well as the relacement of the Group Managing Director of NNPC with an indigene of Niger Delta region. 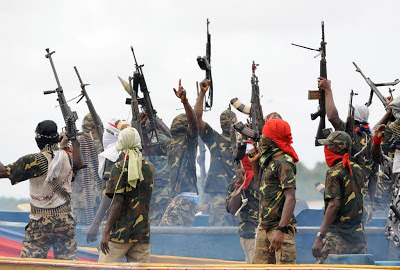 Among the Niger Delta militant groups that formed the coalition include Gen. John Duku (Niger Delta Watchdogs); Gen. Ekpo Ekpo (Niger Delta Volunteers); Gen. Osarolor Nedam (Niger Delta Warriors); Major-Gen. Henry Okon Etete (Niger Delta Peoples Fighters); Major-Gen. Asukwo Henshaw (Bakassi Freedom Fighters); Major-Gen. Ibinabo Horsfall (Niger Delta Movement for Justice); Major-Gen. Duke Emmanson (Niger Delta Fighters Network); Major-Gen. Inibeghe Adams (Niger Delta Freedom Mandate); and Major-Gen. Ibinabo Tariah (Niger Delta Development Network).